Monday, 06 May 2019 at 2:00 PM . This ticket is for children aged 0-18 months old only. 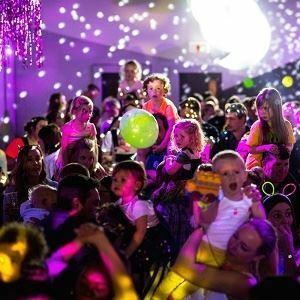 'Get a-Maying with pioneering, award winning family rave Big Fish Little Fish at this 'Flower Power' themed event on a dance floor complete with bubbles, balloons, confetti cannons and (ahem...) falling blossom (er - snow machine). Have a Spring frolic with rave legend DJ Mark Archer (Altern 8) and an upfront selection of bangin' club classics from acid house onwards that will keep everyone moving from the very start all the way through to the parachute dance finale. Child craft expert, Captain Cookie, will be florally crafty at the craft tables. Something to make, giant colouring in mural, free transfer tattoos and a homemade play-doh table for even the smallest of ravers. And if the little ones need a time out, the baby chill out and toddler play space provides breakaway areas with tents, tunnels, foam mats and a ball pool. Don't forget the fully licensed bar to toast the return of summer! Dress ready to rave with an option for floral or hippie chick style to match the theme. Get groovy and stay cosmic...see you on the dancefloor! 	Parents remain responsible for their children at all times. 	For families with younger children (8s and under) though all ages are welcome. 	No only adult groups admitted. 	A max of 3 children per adult. If a larger group then one adult to two children please for supervision. 	Each member of your group must have a ticket and pre-walking infants free (but ticketed). 	Please be aware that events are standing/dancing with limited seating, club lighting rigs (no strobes) are used and events are busy with around 700 people at each party - which helps create the rave ambience. 	Each event is stewarded and risk assessed in advance. 	Buggies must be left in buggy park and will not be allowed on the dance floor.